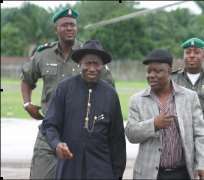 Ubiquitous on the Nigerian political scene; secretive and discreet even by Nigerian standards, vice president Jonathan Ebele Goodluck remains a political enigma. Little surprise therefore that his name featured prominently on the list of individuals funding the militant insurgency that has engulfed the Niger Delta region and threatens to escalate into full scale terrorism, despite an offer of amnesty by President Umaru Musa Yar'adua. Also on the black-box list are various leading political and military figures including the Niger Delta Minister, Elder Godsday Urebebe who is in the penultimate stages of transferring his ministry from Abuja to offices in each of the nine states making up the Delta region. The list was among documents seized by elements of the army's Joint Task Force (JTF) on May 27, when it raided and destroyed the Camp 5 headquarters of High Chief Government Ekpemupolo, alias Tompolo, a MEND commander with links to Delta politicians and whose involvement in the conflict goes back to the Ijaw-Itsekiri communal violence in 1997. Three State Governors - Emmanuel Uduaghan of Delta State, Rotimi Amaechi of Rivers and Timipreye Sylva of Bayelsa – also featured prominently on the now infamous Tompolo's black box list; as are several Ijaw politicians and prominent local state officials including George Timinimi, who runs the Delta State Ministry of Water Resources; a close Tompolo ally, turned rival. The JTF found documents setting out ties between the militants and various local and national political and military figures who back mobs in the Delta region. Although Yar'Adua promised last month, to make the list public, presidential sources told Huhuonline.com that an embarrassed and shell-shocked Yar'adua ordered that the list be sealed and kept incommunicado from the public. Huhuonline.com has also learnt that Yar'adua is under enormous pressure, especially from the army not to publish the list. Some PDP bigwigs fear that publication of the list will not only deprive the President of key political allies in the South like Goodluck Jonathan, former Bayelsa state governor; the public embarrassment of a sitting vice-president's involvement in treasonable activities will provoke a political backlash that might negatively impact the political fortunes of the PDP in the South, ahead of gubernatorial elections next year. Now that political and intelligence calculations have trumped the public's right to know, it remains to be seen whether Yar'adua has the character and leadership to tackle the fallout of his tacit complicity in criminal wrong-doing. Already, political hatchet men like James Ibori are trying to build up pressure to bear on the President to withdraw Urubebe's appointment as Niger Delta Minister. Recall that Urubebe, an ethnic Ijaw was to have been officially named to the newly-created post of Minister for the Niger Delta on November 29 last year, but the appointment was put back at the last moment because of opposition from Delta State Governor, Emmanuel Uduaghan; himself on the black box list. Uduaghan's opposition to Urubebe's appointment, was at the behest of predecessor as governor of Delta State, James Ibori, the major financial contributor to Yar'adua's electoral campaign. Ibori is the object of several corruption investigations and his assets in Britain worth $ 35 million have been frozen. Urubebe figures among Ibori's accusers who filed a suit against him before the Economic and Financial Crimes Commission (EFCC) in March. In coming weeks, the Niger Delta minister, Urubebe will complete the transfer of his ministry from Abuja to offices in each of the nine states making up the Delta region. The decision to move personnel closer to the area they administer was taken by Yar'adua in June to accentuate the image of government being closer to inhabitants. The creation of the new ministry and the appointment of an Ijaw as its boss are meant to smooth over relations between the government and the restive local communities in the Delta. Most of the militants, particularly the Movement for the Emancipation of the Niger Delta, (MEND) which has carried out most of the attacks against oil firms are Ijaws. Urubebe will have authority over nine states that produce petroleum, including the six leading ones, Edo, Delta, Bayelsa, Rivers, Akwa Ibom and Cross Rivers. The Delta Ministry, which was created in September, 2008, had to wait until December to start functioning with the arrival of Urubebe, the first to hold the portfolio. The ministry, which was officially set up to improve infrastructure and promote jobs for young people, has been criticized for lacking in funds. Only $314 million was earmarked for it in the 2009 budget even though the population of the nine states amounts to over 35 million people. The geopolitical decision to re-locate the ministry can also be explained by the continuation of violence and sabotage in the Delta. A recent amnesty offer by Yar'Adua and the release from prison of Henry Okah, presumed MEND leader on July 13, have failed to dampen down violence in the region. Still, MEND has decreed a 60 day cease-fire.